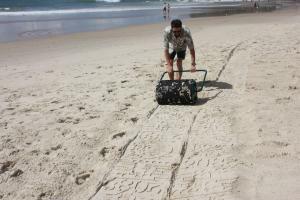 The idea for ‘See Change Sand Tracks’ developed in the first phase of the Generate program*, where participants were brought together to ideate and design projects for consideration in the GC2018 program. Drawing on his knowledge of the Gold Coast, Tristan (founder and co-director of Relative Creative) identified our beaches as a key space that could be activated through art. Relative Creative began to work on ideas for how we could make this an engaging, meaningful and designed experience. From this ‘See Change Sand Tracks’ was born. *Relative Creative is receiving funding for the project See Change Sand Tracks through the Generate program. Generate is a City of Gold Coast initiative through the Regional Arts Development Fund, a partnership between the Queensland Government and the City to support local arts and culture in regional Queensland.